High Quality Sound: With A2DP function. High-performance built-in microphone with Echo cancellation and noise suppression (CVC) technology which can offer your clear talking and stereo music sound. 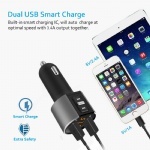 Dual USB Charging Port: Bovon Bluetooth Car Kit with smart charging technology will auto detect and adapts proper input current for your devices, 5V/3.4A output enables you to quickly charge your cellphone, iPad, tablet or other portable devices. 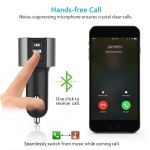 Easy to Operate: This FM transmitter supports Bluetooth hands-free calling while driving: Bluetooth answer/ hang up the call, paly and pause the music, adjust the volume, set frequency, choose music. Universal Compatible: This hands free car kit can be paired with any device compatible bluetooth. Supports USB flash driver, MP3 / WMA format. 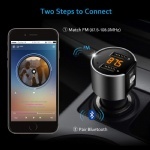 Bluetooth FM transmitter enables you to enjoy stereo music sound, charge your device. Better for empty channel. Perfect Design & Warranty: Simple and stylish design with comfortable and lightweight material, wear- resistance. 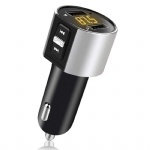 Bovon mini Bluetooth FM transmitter includes 24-hour customer service, 45 days free refund and 12 months warranty.